Environmental factors play vital roles in successful plantation and cultivation of tree seedlings. This study focuses on problems associated with reforestation under extreme continental climatic conditions. The objectives were to assess relative seedling performance (survival and growth) with respect to plantation age, and to analyze the influence of specific climatic factors during the early stages of Scots pine (Pinus sylvestris L.) plantations. The study was carried out in reforested areas of the Tujyin Nars region of northern Mongolia on six Scots pine plantations ranging from 5 to 10 years. In each of the six plantations, five 900 m2 permanent sample plots were established and survival rates and growth performance measured annually over 7 years. Results show high variation in survival among the plantations (p < 0.001, F = 29.7). Seedling survival in the first year corresponded directly to the number of dry days in May. However, survival rate appeared to stabilize after the second year. The insignificant variation of height categories throughout the observation period indicated low competition among individuals. Two linear mixed-effect models show that height and radial growth were best explained by relative air humidity, which we consider to be a reliable indicator of site-specific water availability. Insufficient amounts and uneven distribution of rainfall pose a major threat during the first year of plantation establishment. Humidity and water availability are decisive factors for a successful seedling plantation. This highlights the impact of drought on forest plantations in northern Mongolia and the importance of developing climate resilient reforestation strategies. Project funding: The work was supported by the Partnerships for Enhanced Engagement in Research (PEER) Science Cycle 2 Grant #296 ‘Building research and teaching capacity to aid climate change and natural resource management at the National University of Mongolia (NUM)’. Forest plantations provide a range of benefits, including playing a key role in ecosystem functionality (Hector and Bagchi 2007), offsetting continuing deforestation and degradation (FAO 2010), providing carbon sequestration (Kongsager et al. 2013) and storage (Chen et al. 2015), promoting efficient nutrient cycling (Ma et al. 2007), increasing plant species diversity and community structure (Eycott et al. 2006), and preventing soil erosion (Lawson and Michler 2014). Forested areas regulate streamflow and modify the magnitude of peak flows (Buendia et al. 2015), and improve soil water retention (Kahle et al. 2005). The benefits of establishing plantations in specific areas of open land are therefore twofold, in that they meet increasing demands for timber by reducing deforestation (Pirard et al. 2016), but also strengthen local ecosystem functions. However, it can be difficult to establish forest plantations in dry, continental regions. A number of previous studies have shown that changes in seedling survival rates and growth performance may be due to limited light availability (Kunstler et al. 2005; Hattori et al. 2009), nutrient deficiencies (Oscarsson et al. 2006; Löf et al. 2007), interspecific competition (Osunkoya et al. 2005), and changing environmental factors (Soehartono et al. 2002; Battles et al. 2008; Hattori et al. 2013). Establishing plantations on logged-over land, previously dominated by conifers, with seedlings of native species is one way to accelerate forest recovery mechanisms. However, Löf et al. (2007) reported that the mortality of seedlings planted on open sites is higher than seedlings planted under a native tree canopy. Mongolia has relatively low amount of forest resources. Forest cover represents roughly 7–8% of the territory; the most recent National Forest Inventory (MPNFI 2016) reported that boreal forest cover is nearly 9.1 million hectares (< 6%) and is found in the transitional zone between the Siberian boreal forest and the Central Asian dry steppe (Mühlenberg et al. 2012). This transitional zone is characterized by a highly continental climate with dry winters. Forests in Mongolia mainly grow on mountain slopes between 700 and 2500 m a.s.l. World Bank studies (Crisp et al. 2004; Mühlenberg et al. 2006) have shown that climate change may affect the distribution, natural regeneration and successful reforestation of Mongolian conifer forests, and that newly planted species often appear to be heavily affected by human disturbances, especially unregulated livestock grazing. According to statistics collected over the last 100 years, 40% of all Mongolian forests have been directly affected by human activities which have largely had adverse effects (Tsogtbaatar 2004). Overall, 684,000 ha of previously forested areas have not regenerated after fires, and another 159,000 ha have been converted into non-forested ecosystems. The first reforestation trials were carried out in Mongolia in the 1970s. However, efforts at forest rehabilitation with native species have had relatively limited success around the country. Today, most plantations are monocultures established from 2-year-old seedlings of Larix sibirica Lebed. and Pinus sylvestris L. Chamshama et al. (2009) underline the degree to which successful plantation establishment depends on planting design and the selection of appropriate species but also relies on silvicultural, ecological and economic aspects. Scots pine (P. sylvestris) is an important species for the region in terms of forest cover, timber production and reforestation management. Planting of Scots pine is typically carried out in the first half of May which usually coincides with a lack of rainfall, prolonged drought and high winds. The Tujyin Nars Special Protected Area (SPA) is a representative area for successful reforestation in northern Mongolia. Current statistics show that over the last two decades, some 21,000 ha of previously logged land in the Tujyin Nars region have been artificially reforested (Gerelbaatar 2012). In spite of the importance of forest plantations in Mongolia, there is little information on early survival and growth performance of seedlings. The main objectives of this study were: (1) to assess seedling survival and growth with respect to plantation age; and, (2) to analyze the effects of climate factors on seedling survival during the growing season in the early stages of establishment. Following an in-depth analysis of the results, survival rate and growth of seedlings is explained with linear mixed-effects models (LMM). The study was carried out in the Tujyin Nars National Park (50°05′ and 50°12′N, 106°14′ and 106°31′E) in the Selenge province of northern Mongolia (Fig. 1). The SPA stretches approximately 33 km from east to west and covers an area of 73,000 ha, of which 45,800 ha are natural pine forests and 21,000 ha are Scots pine plantations (Gerelbaatar 2012). According to the updated world map of the Köppen–Geiger climate classification (Peel et al. 2007), the region lies within the transition climatic zone between a cool continental climate (Dwc) and a cold semi-arid climate (Bsk), with small pockets exhibiting a temperate continental climate (Dwb). The temperature at the nearest meteorological station in Sukhbaatar, 15–20 km north-west at 660 m between 2003 and 2014 averaged 0.3 °C. The average annual precipitation was 249.8 mm with a precipitation peak between June and August. The dry season extends from March to June in spring and from August to October in autumn (Regzedmaa 2008). According to meteorological data, total annual precipitation and mean annual temperatures have varied over previous decades. Figure 2 provides an overview of the climate characteristics of the area based on data from the Meteorological station Sukhbaatar, 2003–2014. The soil in the study area is mainly of haplic arenosols developed from sandy sediments (JICA 1998). Planting was carried out in the beginning of the growing season (first half of May) from 2003 to 2008. 2-year-old bare-root seedlings of Scots pine were transplanted manually using the slit planting method. The initial planting density of each plantation was 2500 seedlings ha−1 (4.0 m × 1.0 m spacing). Six neighboring reforested stands were selected, representing early survival and growth of Scots pine. All plantations were monocultures established at different times and on clear-cut forested land following frequent intense fires (Table 1). The plantations were located close to each other and exhibited similar site conditions. They were selected to represent the typical early development phase of plantations in the study area. Field measurements and data collection were carried out annually in September/October between 2003 and 2010. On each of the six plantation sites five square permanent sample plots, (overall: 6 sites × 5 plots = 30 plots), each measuring 900 m2 (30 m × 30 m) in completely randomized design were established. Annual field measurements of seedlings included: diameter at stem base, total height and annual height increments. The survival rate of planted seedlings on each plot was assessed by counting both live and dead individuals at the end of the annual growing season (September). The survival rate of each plantation was estimated annually (2003–2010). Height was measured to the nearest 0.01 m with a measuring tape, and at stem base, the diameter was measured to the nearest 0.1 cm with calipers. Annual tree-ring width of medium-sized samples, (5 cores from each plot), were measured at the Laboratory of Dendrochronology at the Mongolian Academy of Sciences (MAS). For the analysis of survival and seedling growth, one-way analysis of variance (ANOVA) was used to determine statistically significant differences in means among variables between the sites, and an F-test was used to determine equality of group means (Fisher 1925; O’Brien 1979). Pearson’s correlation coefficient (Edwards 1976) measured the strength of the linear association between the sum of annual heights and radial increments of the second and third years after plantation establishment, and the average values (annual and growing season) of climatic variables of the respective time frame: Bayanbulag (2004/2005), Moilt guu (2005/2006) Bayanbulagyin denj (2006/2007), Tujyin Nars (2007/2008), Khudgyin guu (2008/2009), Kudgyin guunyiar (2009/2010). The first year when the seedlings were planted may be considered as an adaptation phase and was therefore not included. The following climatic factors and indicators for the whole year and growing season (May–August) were considered in the correlation analyses: sum of precipitation, average air temperature, average relative air humidity and number of dry days, the latter refers to the average number of days below a critical level of air humidity (< 30%). All seedlings were classified into three height categories relevant to neighboring seedlings in each plot, which, in a similar fashion, is often applied to estimate competition in stands (see for example, Krstic et al. 2012). Since the seedlings were in a very early competition stage during which direct competition played no role or a subordinate role, the following terms were applied: ‘accelerated growth’ instead of ‘dominant’; relatively ‘average growth’ instead of ‘codominant’; and, ‘retarded growth’ instead of ‘suppressed’. Based on the results on seedling survival (Table 2), the most positive and the most negative pointer years were selected and the respective course of precipitation and temperature of the respective year compared against the average course of the climate factors during the observation period (2003–2010). where β0, β1,i, b2,j are the parameter estimates of the intercept (I), the number of dry days in May (D), and the site (s), respectively; εij = error term of the population i at site j.
where, β0, β1,i, b2,j are the parameter estimates of the intercept (I), the annual relative average air humidity (h) of the plantation and the site (s) respectively; εij = error term of the population i at site j. The following software packages/routines were used: R-statistics (R Development Core Team 2016) with the packages nls2 (Grothendieck 2013), nlme (Pinheiro et al. 2018), ncf (Bjornstad 2013), car (Fox and Weisberg 2011), and lattice (Sarkar 2008). As part of the LMM (R-bloggers 2011), the test for spatial autocorrelation was conducted with an adjusted script based on a version from Gradel et al. (2017a); an initial version was provided by the Chair of Silviculture at TU Dresden. There was a massive mortality of seedlings during the growing season the first year after plantation establishment in 2006, 2007 and especially in 2008 (sites TN, KHG, and KGA). There was a significant difference (p < 0.001, F = 29.7) in the rate of seedling survival among the plantations. Table 2 provides an overview of the survival of planted seedlings over the monitoring period in the plantations. 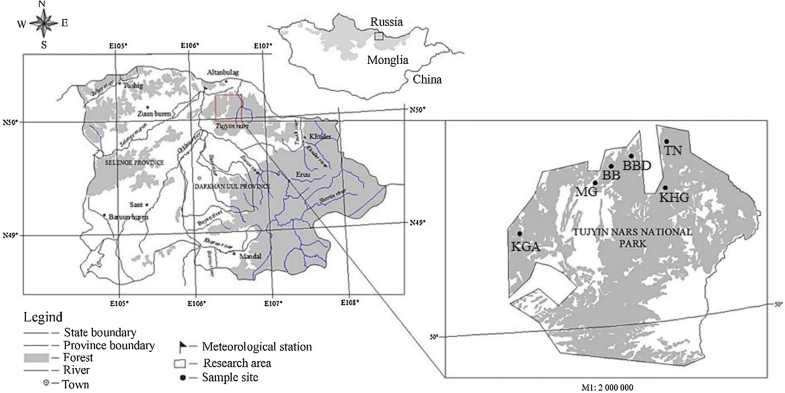 We first analyzed the distribution of annual monthly air temperatures and precipitation collected from the neighboring Sukhbaatar meteorological station. The variation of annual precipitation (p < 0.001, F = 4.6) and air temperatures (p = 0.006, F = 9.1) were significantly high, and precipitation showed an uneven distribution during growing seasons (Fig. 2). The survival of Scots pine plantations correlated positively with monthly precipitation and air temperatures during the growing season. In contrast, seedling survival was more dependent on monthly precipitation than on air temperatures. A relatively strong correlation between rainfall and seedling survival was observed in June (r = 0.41; p = 0.05) and July (r = 0.46; p = 0.05). However, among of all climatic factors and indicators, the number of dry days (D) showed the strongest correlation with seedling survival: (Dmay: 0.76, Djune: 0.69, Dvegetation period: 0.71 with p = 0.005 and F = 3.76). Height and radial increments in the first year following transplanting were consistently less than those measured in the second year, and ranged from 4.8 ± 1.2 to 7.5 ± 1.6 mm in height and 0.3 ± 0.2 to 0.9 ± 0.2 mm in radial growth, and clearly dependent on the amount of rainfall in the growing season. These results reveal that annual height increments of seedlings for the plantations exhibited similar growth trends that increased in the second year after planting, effectively in parallel with the age of the plantation (Figs. 3, 4). While growth trends among the plantations were similar, a significant difference in height growth was observed (p = 0.0004; F = 26.8). The mean annual height increment of seedlings differed for all plantations, of which the lowest was observed in BB and highest in BBD (Fig. 3). When assessing radial growth, there was a similar tendency as in height growth; the annual increment of radial growth in the planting year was the lowest, which may in part be related to transplant shock (Figs. 3, 4). For all plantations, a gradual increase of both height and radial increment was observed at the beginning of the second year. Increasing height and radial increment of seedlings/saplings was recorded each year, with the exception of 2006 and 2008, with particular focus to radial growth. The standard deviation of individual tree height growth was often higher than for radial growth measured in each plantation. The initial analysis of the impact of climate variables on height and radial growth in the second and third years after planting indicated rather low values for height growth. With regard to effects on radial growth, precipitation, air humidity and temperature showed higher correlation values, but only the relation between radial growth and average annual relative air humidity, showed a significant correlation (Table 3). All seedlings were divided into three height growth categories: accelerated growth, average growth and retarded growth. Overall, the distribution of trees by height categories did not significantly differ (p = 0.18; F = 2.62) among plantations with different ages. In this study, most of the planted trees belonged to the average growth category (64–81.6%), while 15.0 ± 3.2% of the remaining trees were classified as accelerated growth and 11.8 ± 1.3% were in the retarded growth category (Fig. 5). The greatest variation in height categories were observed at the time of plantation establishment. In terms of seedling survival in the year of planting, 2003 was identified as a positive pointer year (survival rate > 97%) and 2008 as negative pointer year (survival rate < 16%), as shown in Table 2. The annual sum of precipitation of the positive pointer year (2003) was below average but above average during May. Conversely, in the negative pointer year (2008), the precipitation in May was below average, whereas the sum of precipitation was relatively high (Fig. 6). Based on the results, linear mixed models were developed to predict first-year survival and growth rates over subsequent years. Sufficient humidity levels significantly influenced survival rates of planted pine seedlings in the first year and strongly contributed to seedling growth in subsequent years. Different indicators, however, provided the best results for predicting survival and growth rates. The number of dry days in late spring (Dmay) had a particularly strong impact on first-year survival and varied considerably from year to year. With regard to seedling growth after plantation establishment (second year onwards), average annual relative air humidity (H) provided the most reliable results for the whole observation period. Both explanatory approaches (height growth and radial growth) resulted in highly significant p values for the explanatory variable. The variation of H was relatively low throughout all the study years; see Table 4, Fig. 7 for a graphical representation of the models. 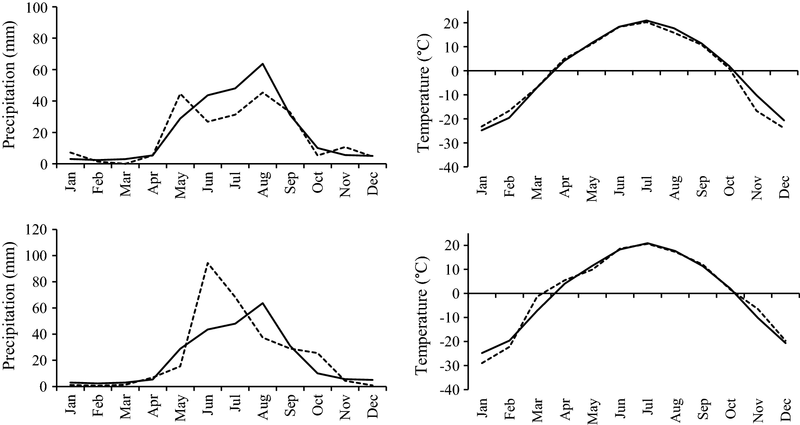 In this study, seedling survival and growth in the forest steppe of northern Mongolia are largely dependent on climatic factors. As expected, the amount of precipitation and its distribution throughout the growing season is crucial. The study region is characterized by highly variable rainfall regimes and relatively low air humidity levels throughout the growing season. First-year survival of transplanted seedlings plays a crucial role in the subsequent success of plantations. Brunner et al. (2015) noted that seedlings might take some time after planting to re-establish appropriate root architecture systems able to support the growth of apical shoots. Thus, the first months after planting are a decisive time for planting success. Sufficient water supplies during the initial growing season, especially immediately after planting, is a major determining factor for reforestation success. Our data analyses indicated that a lack of humidity during and directly after initial planting causes mass mortality of seedlings (Table 2; Fig. 6). On the other hand, sufficiently humid conditions during the month of May allowed for fairly good survival. This became especially clear through the comparative diagrams of the pointer years and the survival model of seedlings. Mass mortality was observed in 2008 (KGA) (Table 2), which may be explained by a lack of rainfall for May. Interestingly, instead of precipitation itself, it was the number of dry days in May, which we consider as a kind of dryness indicator, which gave the best model results for seedling survival (Fig. 7a). Critical dry periods in June 2006 (2.5 mm) and May 2008 (15.4 mm) resulted in relatively low survival of first-year seedlings in plantations TN (61.7%) and KGA (15.3%), respectively (Table 2). Meanwhile, in 2003, 2004 and 2007, the amount of rainfall during the growing season was relatively high and resulted in better survival rates, as recorded in BB (97.9%), MG (92.6%) and BBD (78.4%) (Table 2). 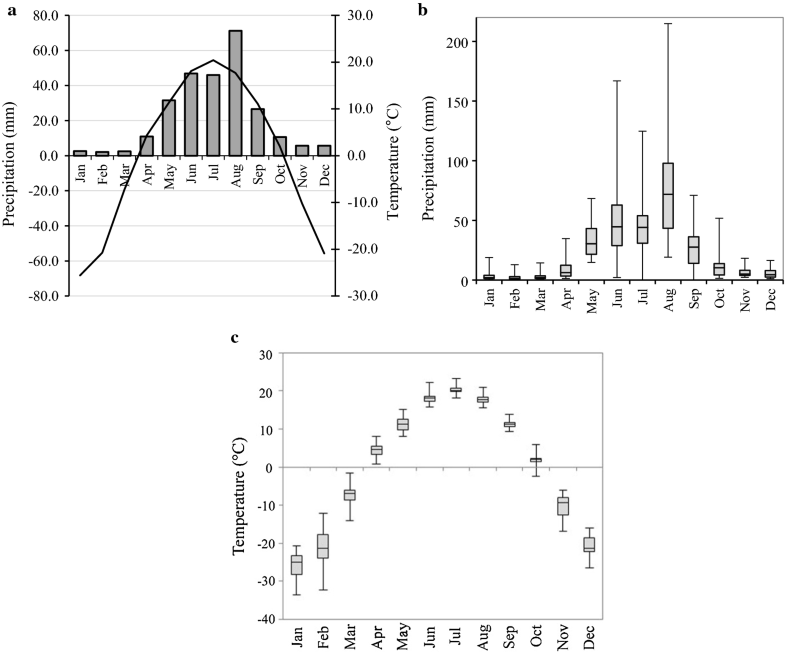 These observations indicate that weather conditions during spring, specifically the month of May (versus the sum of precipitation measured for the whole year), played a crucial role for seedling survival in this region of Mongolia. This study provides a quantitative orientation for projected survival rates based on the number of dry days (D) in May (Fig. 7a). One of the reasons why weather conditions in May were important in the analysis of seedling survival was that the seedlings were planted during May. Establishing plantations in autumn may lead to different results, in terms of both individual tree survival and fixed-effects on forest structural parameters. The results, however, show that environmental conditions, both during and immediately after planting, represent a key factor in the successful survival of seedlings in Mongolia. Regarding growth performance after plantation establishment, the pattern is somewhat different. Water availability throughout the year is of much greater importance. The correlation of height and radial growth with total annual precipitation was higher than for the growing season (Table 3). The LMM results for height and radial growth modeling showed that growth of the plantations can be directly related to air humidity throughout the year (Fig. 7b). Air humidity may be considered as an indicator of planting success, which incorporates both precipitation and temperature. In general, seedlings are typically more sensitive to water deficits than older trees due to their less developed root systems. For example, a climate-growth study in the Altansumber research area of the Mongolian mountain forest steppe showed that young birch trees were more prone to react favorably to precipitation than older trees (Gradel et al. 2017b). However, these findings were observed in naturally regenerated forests. Scots pine is a light-demanding species that is moderately drought resistant and has modest nutritional requirements which makes it better suited to nutrient poor soils than other species (Lawson and Michler 2014). 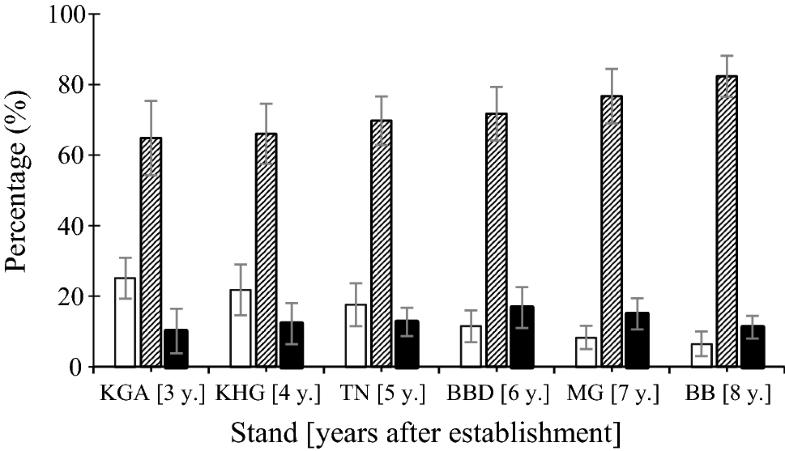 The absence of shading from mature trees in stands might have had a favorable effect on seedling growth during the early stages of plantation establishment. The largest differences between relative height categories were observed in the first two years after planting, which was mainly caused by individual adaptation to the new growing environment. The ever-increasing proportion of average classified height categories and gradual reduction of accelerated height categories indicates a low competition rate between individuals. Our results show that during the first years of plantation establishment, variations in height among individual seedlings gradually decreased (Fig. 5). This will most likely change as the trees grow older and competition becomes more important. Competition is another important factor affecting tree growth (Gadow 2005; Gadow et al. 2012; Klädtke et al. 2012; Gradel et al. 2017a). In the context of the current developmental stage of the Scots pine plantations, drought stress is the dominant limiting factor for seedling survival (Dulamsuren et al. 2013) and growth (Cregg and Zhang 2001; Turtola et al. 2003). It has also been shown that for mature Scots pine, a clear correlation exists between growth and water availability in the forest steppe zone (Babushkina and Belokopytova 2014; Demina et al. 2017). Water availability is considered the most important limiting factor affecting plant productivity and is an important ecosystem driver in general (Heisler-White et al. 2008; Liu et al. 2013). Williams et al. 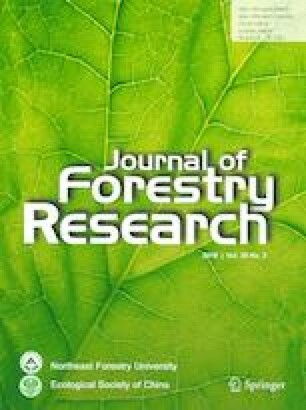 (2013) highlighted the finding that semi-arid forests experience seasonal water stress and may be particularly vulnerable to even slight increases in water deficit, which can inhibit tree growth and trigger increased mortality. A study on tree distribution, growth and survival within populations of Scots pine grown at sites in Europe and North America showed that even modest climate warming will likely have a positive influence on Scots pine survival and growth in the northern parts of the species range, and will negatively impact the more southern range of the species (Reich and Oleksyn 2008). Temperatures in the southern boreal forests of Eurasia have warmed rapidly in recent decades, particularly in spring, and this is projected to continue in coming decades (Schär et al. 2004; IPCC 2007). A number of studies have reported that global warming, combined with increasing aridity, are the main drivers of changes in species composition (Pawson et al. 2013; Benavides et al. 2015), and directly impact on forest ecosystem rehabilitation (Hattori et al. 2013). Consequently, forest vulnerability to climate change has increasingly becomes a topic of considerable interest to the forestry sector, most notably in Eastern Asia (FAO 2010; Cui et al. 2016). Recent studies have shown that semi-arid ecosystems are particularly vulnerable to climate change and the increased risk of more frequent and severe droughts (Ma et al. 2015; Rammig and Mahecha 2015). A recent study indicated that the physiological responses of seedlings to drought stress that ultimately causes them to die, can differ between species (Ivanov et al. 2019). Findings from this study identified carbon starvation, resulting from rapid root growth at the onset of water stress, as the primary cause of death for Scots pine seedlings. To date, relatively few studies have addressed the effects of climate warming on seedling mortality and growth of forest plantations in Mongolia (Dulamsuren et al. 2013). Forests have the potential to buffer climate effects, notably by protecting the soil from high solar radiation and elevated summer temperatures. In the context of global warming, effective climate resilient afforestation and reforestation efforts have become critically important for the future of Mongolia. The combined effects of accelerating climate change, ongoing desertification, and the ever-present risk of drought projected to occur with higher frequency (Oyuntuya et al. 2015; Ubugunov et al. 2017), underline the need to develop sustainable and effective forest planting practices to respond to the unique set of conditions specific to Mongolia. Lower survival rates and largely ineffective reforestation efforts have limited forest plantations in Mongolia to only 300,000 ha. Approximately 30% of these have been established in the Selenge Aimag. Valuable insight can be gained from similar scenarios in other Asian countries, for example, by using containerized seedlings instead of bare-root seedlings. One option might be to incorporate the use of mycorrhiza or endophytic fungi to enhance plant growth. Mycorrhizal fungi are known to improve plant ability to absorb both nutrients and water as they effectively increase the surface area of absorbing roots and, in general, lead to improved plant health and biomass production (Dighton and Skeffington 1987; Niemi et al. 2002; Alberton et al. 2010). For greater success in establishing plantations in harsh environments under dry soil conditions, Cortina et al. (2013) suggested planting seedlings previously cultivated in the open air and under nutrient-limited conditions favorable for root development. An evaluation by Cao et al. (2011) concluded that four key factors should systematically be considered during the early stages of afforestation projects: climate, pedology, hydrology and landscape characteristics. In certain cases, integrating protective coverage of native herb-layer vegetation is appropriate for generating revenue for the local communities (e.g., medical herbs) (Jiang et al. 2016). With regard to species adaptability to new environments with drier conditions, several studies have proposed provenance tests of different regional Scots pine (e.g., Gülcü and Bilir 2017). A targeted approach, such as climate-smart forestry, to build resilient forests in the mountain steppes may allow for a mixture of two or three species, including broad-leaved pioneer species (e.g., birch or aspen). In reforestation efforts with mixed plantations, preference should be given to native species and, where possible (depending on specific site conditions and seedling availability), to more than one native species. Reforestation with multiple native species may help to ensure plantation success. In more forested regions (e.g., Khentii Mountains), enrichment planting might be considered as a means of protecting existing stands and associated ecosystem services by further adding more valuable species, e.g. Siberian larch (L. sibirica Ledeb.) or Siberian stone pine (Pinus sibirica Du Tour). Wang et al. (2012) recommended that forests should be planted with an optimal structure and spatial distribution adapted to the water-carrying capacity of local soils and groundwater conditions. It may therefore also be interesting to research the effect of different planting schemes, such as planting in groups and troops, on survival rate and growth. For example, a comparative study of different planting schemes for oak (Quercus spp.) in Germany, Austria and Switzerland found that troop planting resulted in better stem shape. Troop sizes with more than twelve individuals showed higher survival rates than planting in rows (Saha et al. 2013). There is also an indication that, for different reasons, clumped tree distribution, (potential effects of environmental disturbance and microclimatic conditions), is a common and, in part, natural feature of forest types in the Mongolian mountain forest steppes (e.g., larch and birch forests) (Gradel et al. 2015, 2017b). Landscape features should be considered, e.g., on drier slopes to concentrate planting on the lower parts between humps and small valleys and avoid planting on dry humps. The Tujyin Nars region is a representative site of successful tree planting in Mongolia, and provides ample opportunity to derive general conclusions and recommendations for future planting programs. Our study showed high survival for Scots pine after the first growing season. Observations of steadily increasing height and radial increments, combined with a gradual reduction of growth variations, indicate considerable potential for plantation establishment with this well-adapted native species. Survival of Scots pine seedlings are directly related to meteorological conditions in May (see Fig. 7a). This planting period, however, coincides with unfavorable environmental conditions such as prolonged drought and frequent windstorms, both which effectively create conditions for mass loss of seedlings. This study provides threshold limits for dry days in May that relate to plantation success. As climatic factors and time of planting have a major effect on plantation success, it is critical to rethink current planting practices and research alternatives. Growth performance during subsequent years was best explained by relative air humidity levels throughout the entire growing season (Fig. 7b), which may be considered as an indicator of general water availability. Climate-resilient reforestation guidelines should be developed for different regions throughout Mongolia. Historical data on previous forest cover, soil characteristics, planting schemes, and optimal planting seasons should be considered. If the site was previously forested, species selection should focus on the natural dominant species. The authors would like to acknowledge colleagues at the Tujyin Nars SPA Administration for providing human resources necessary for field data collection. Our sincere thanks to Matthias Meyer (TU Dresden) for valuable comments and to Aimee Orsini (Berkeley, California) for the careful language editing of our manuscript. We are thankful for the useful comments and recommendations of two anonymous reviewers. The R-script for the test for spatial autocorrelation is based on an earlier version from the Chair of Silviculture at TU Dresden (see Gradel et al. 2017a). Results of this study were presented at the GMIT Symposium on Environmental Science and Engineering held in Ulaanbaatar, Mongolia in August, 2018 (Gerelbaatar et al. 2018).